Arsenal forward Theo Walcott is a reported January transfer window target for Everton as Sam Allardyce believes he could replace Romelu Lukaku after his summer move to Manchester United. This is according to the Daily Mirror, who suggest the Toffees could deal a double blow to the Gunners by also beating them to the signing of Sevilla midfielder Steven N’Zonzi. Still, Arsenal fans may be faintly amused by the suggestion that Walcott could come anywhere close to filling the boots of Lukaku at Goodison Park. 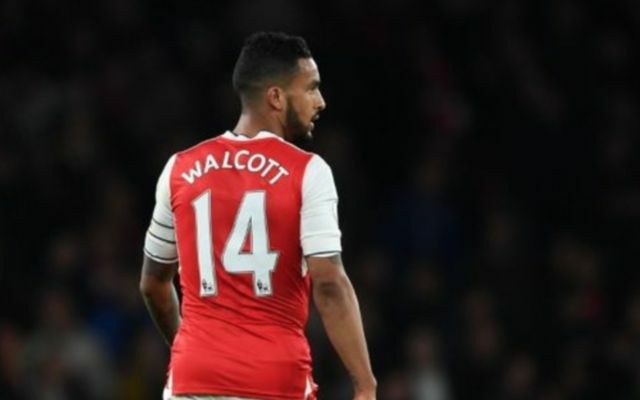 The Belgian front-man hit 25 Premier League goals for Everton last season, and 18 in the year before that, while Walcott has never managed more than 14 in a single campaign for Arsenal. More of a winger than a striker, Walcott has occasionally been used up front by Arsene Wenger, but has never nailed down that role and is now out of the first-team picture altogether. The 28-year-old hasn’t started a league match for the north Londoners so far this term, which perhaps makes a January exit likely as he surely has no other hope of a late push for England’s World Cup squad. A move to Everton could work for him, but if they’re expecting him to bring them what Lukaku did, they’d be better off looking elsewhere.